Pippa Passes, KY: The Alice Lloyd College Lady Eagles gave Coach John Mills a nice prize as they earned victory number 20 on the season with a huge 84-60 defeat of the Brescia University Lady Bearcats. The River States Conference matchup took place on Saturday, February 10. In the opening quarter, the home club rode the hot-hand of senior guard Kayla Wilson to jump ahead from the tip. Her 9 points helped the hosts lead by as much as eight, and they would settle for a 27-22 advantage after ten minutes. In the second stanza, the game became a reversal of fortunes as Alice Lloyd would go stone cold. Over the first seven minutes, the hometown girls would only net 6 points, and Brescia trailed 33-32 with 2:40 remaining. Suddenly, ALC would heat up again and close the period with ten consecutive points and take a 43-32 lead at intermission. The girls from Caney have been successful due to their explosiveness and this game was no exception. The host club opened the third period on a deadly 25-10 run and suddenly led 68-42 as the crowd went wild. The Lady Eagles would take a 69-47 lead into the final quarter. In the last stanza, the advantage would never shrink closer than 17 points as Alice Lloyd would chalk this contest in the victory column. For the West Division-leading Lady Eagles (20-4; 13-3 RSC), sophomore forward Jayla Spurlock would drain 8-9 shots and a perfect 4-4 from long range, to finish with 19 points. Freshman guard Haley Hall and Kayla Wilson were right behind with 16 and 15 points each. 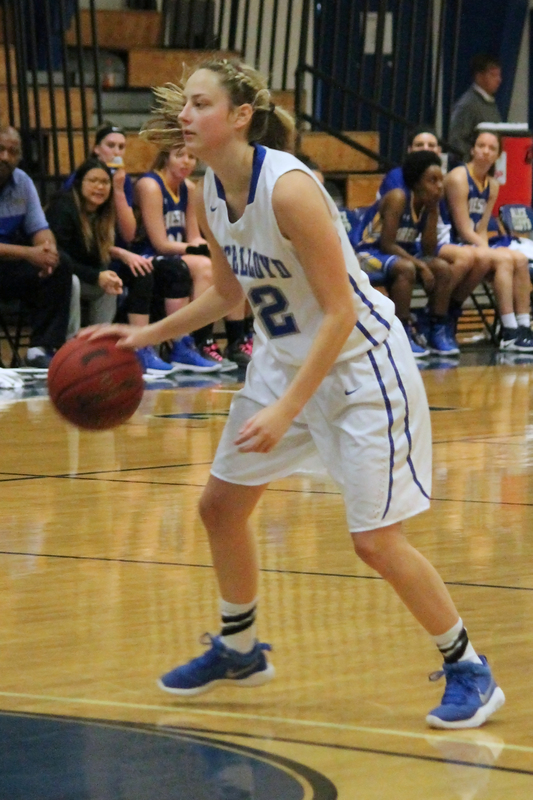 Junior center Emilie Harrell and freshman center Alexandria Clifton chipped in 12 and 10 points respectively. Kayla Wilson also led in rebounds with 8 and tied twin sister Miranda Wilson with 6 assists. Three players each recorded 2 steals (M. Wilson, Hall, Spurlock) while Harrell swatted 2 shots. Alice Lloyd finished shooting 52.7% (29-55) from the field, including a blistering 58.3% (14-24) from long range. They connected on 63.2% (12-19) from the foul line. They also added 34 rebounds, 19 assists, and 7 steals. For West Division foe BU (11-17; 7-9 RSC), guards LeLe Grubbs and Cassidy Moss each had 15 points. Their club shot 37.3% (22-59) from the floor and 39.1% (9-23) from behind the arc. They sank 58.3% (7-12) from the foul line. They also added 29 rebounds, 10 assists, and 7 steals. ALC returns to action on Tuesday, February 13th when they travel to Ohio to face Cincinnati Christian University in an important conference match at 5:30 pm. They close out the regular season Saturday, February 17th when they face conference opponent Indiana University Kokomo in the last regular season contest to be played at the Grady Nutt Athletic Center. Tipoff is set for 1:00 pm. This will also be senior day.